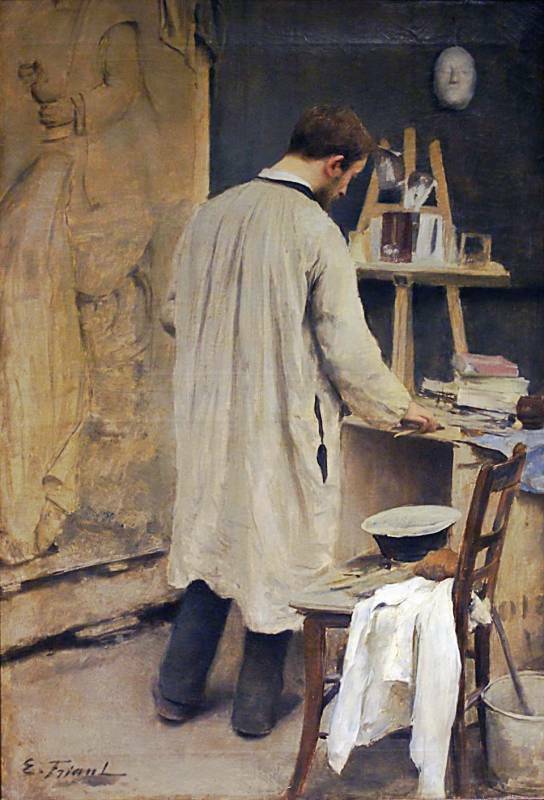 Every craftsman wears the most suitable clothing for his work, with the aim first of all to protect his body. The differences consist in the type of garment but also in the different type of fabric or leather that can be more or less indicated on the materials and equipment used. Today, workwear has become as a safety clothing, including those jobs that were not considered particularly dangerous in the past. Many garments must be heat, flame or chemical or electrical hazard proof. It is also true that many tools have radically changed, most of them have electric power and are increasingly performing. 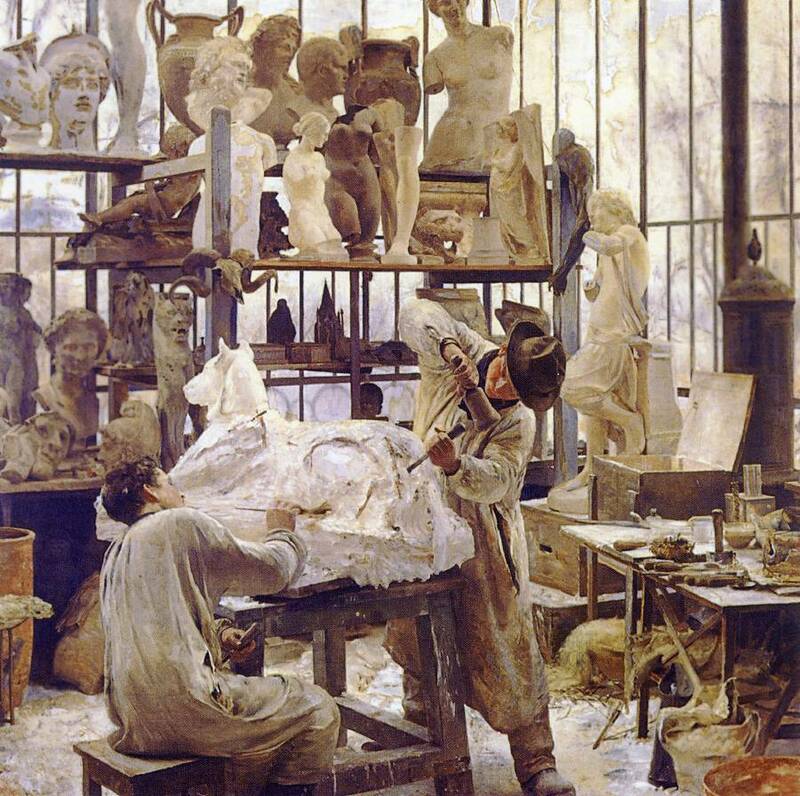 In the past the carpenter used only manual tools, today almost exclusively electric. Improvements in performance and quality, but often increase the risk if you do not adapt that with clothing. 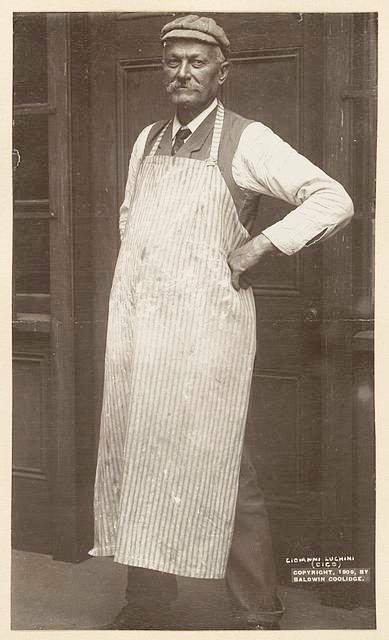 In this nostalgic image of 1909 the Italian Mold Maker Giovanni ‘Cico’ Luchini is wearing his typical Apron long over the knees, with no pockets and surely his shirt and tie. 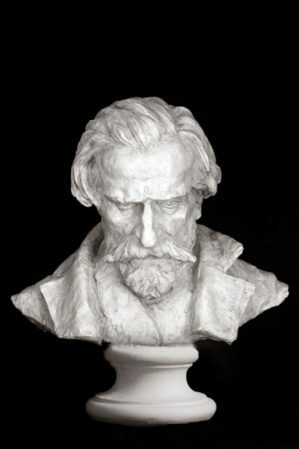 Luchini was a skilled mold maker who worked also in the famous P.P. Caproni and Bro. factory in Boston. (Really thanks to Mary Edgar for this beautiful photo and to share the exciting Cico’s story life with me). 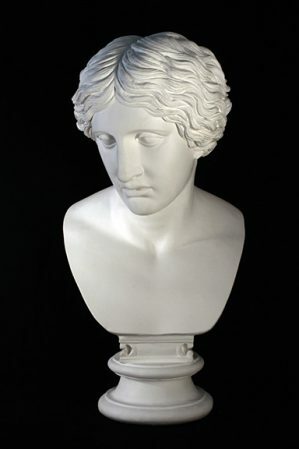 The mold making, is an art that does not ignore new technologies and new materials but to offer a product of high quality must necessarily maintain the old technique and preserve the rules of the past. 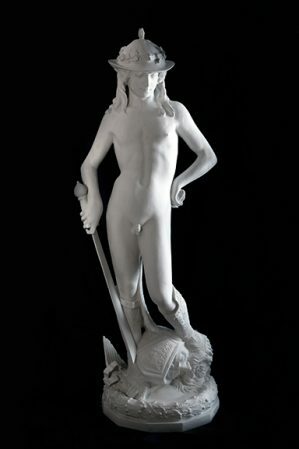 The work has changed little through the centuries and even the clothing as a result. 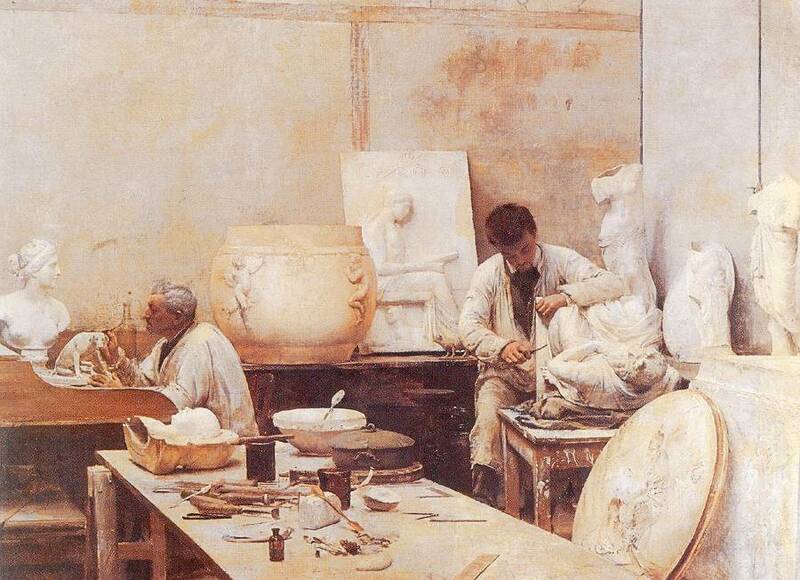 I am intrigued to discover from the old photos or paintings that shows shops and Ateliers as the work was done. By analyzing these little details it is possible to get a large amount of information and find out how the work has changed or not at all. 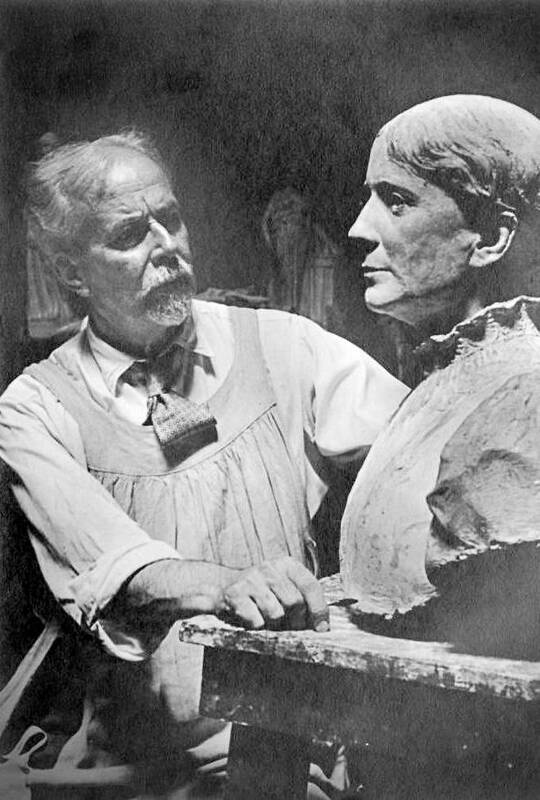 The Italian Mold Maker Enrico Cantoni, who worked in London, while is molding a clay sculpture by the famous artist Edouard Lanteri. Cantoni is wearing a simply Smock under the Apron. 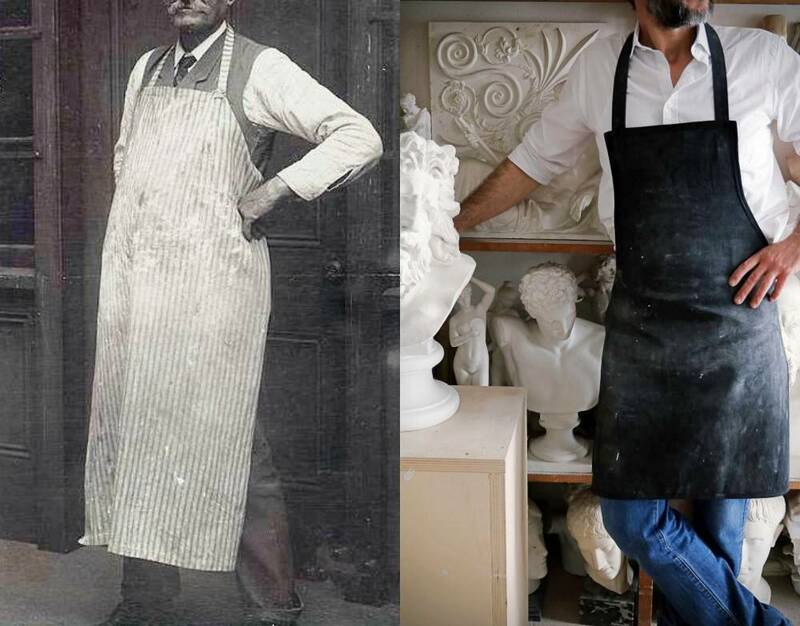 In particular, I was intrigued by a specific behavior, that of many sculptors who at the end of the nineteenth and early twentieth century used to work almost always wearing a distinct clothing with shirt, jacket or waistcoat often in a tie, on which they then wore a (coat) Smock. 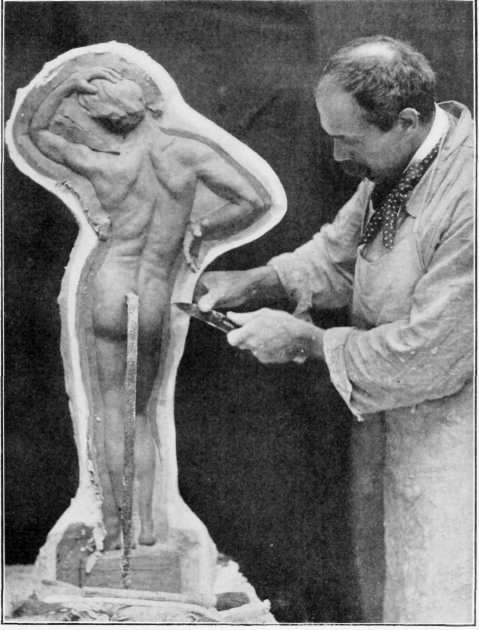 The Master Mold Maker instead used to wear the smock for the most sedentary or dry work or the Apron for the most dynamic work with wet plaster. Instead, the aids wore only the apron or even more or less fortune attire made of old and worn suit or trousers and shirt. 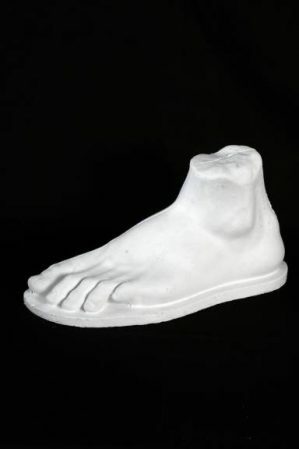 The difference between the work of the sculptor and the mold maker (excluding rare cases) certainly lies in the fact that the mold maker’s work is much more dynamic, more physical, requires more energy and space of movement. 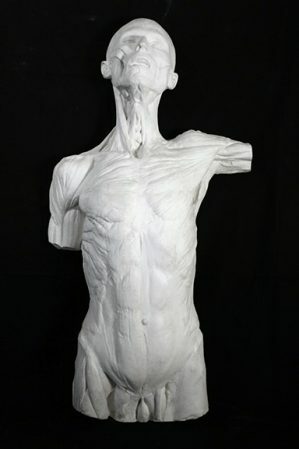 During the making of a mold, with the use of plaster mixed in large quantities, the moldmaker must perform many movements with the whole body so that this operation can be considered a real performance. 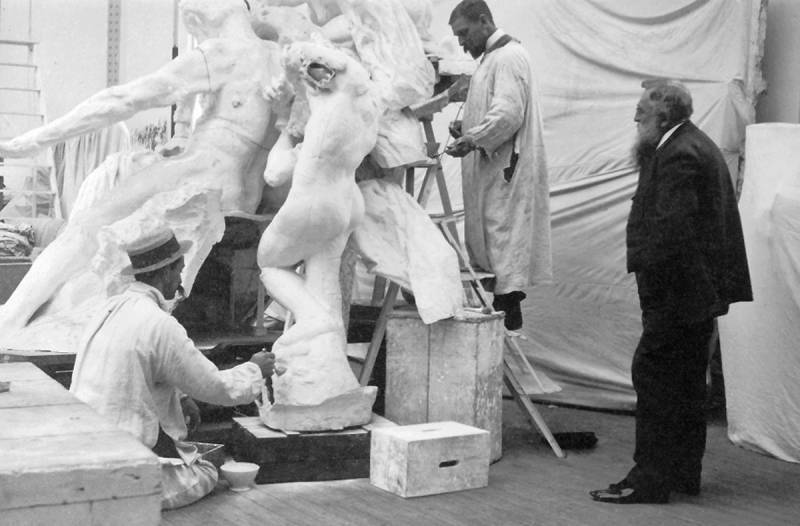 In this picture auguste Rodin supervising the assembling work of a plaster sculpture by two mold makers. They are wearing, for this light work, a cheap smock made in a row fabric but it is still interesting to notice how they try, in some way, to always maintain a certain elegance and dignity of the clothes, even working with the straw hat. 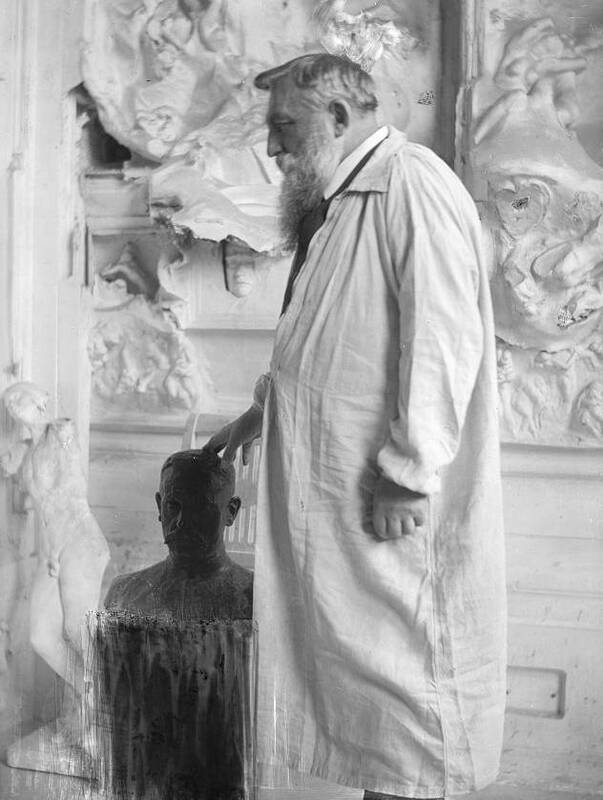 This professional Sculptor’s smock was on sale by the english art supplier Alec Tiranti in London, 1934. 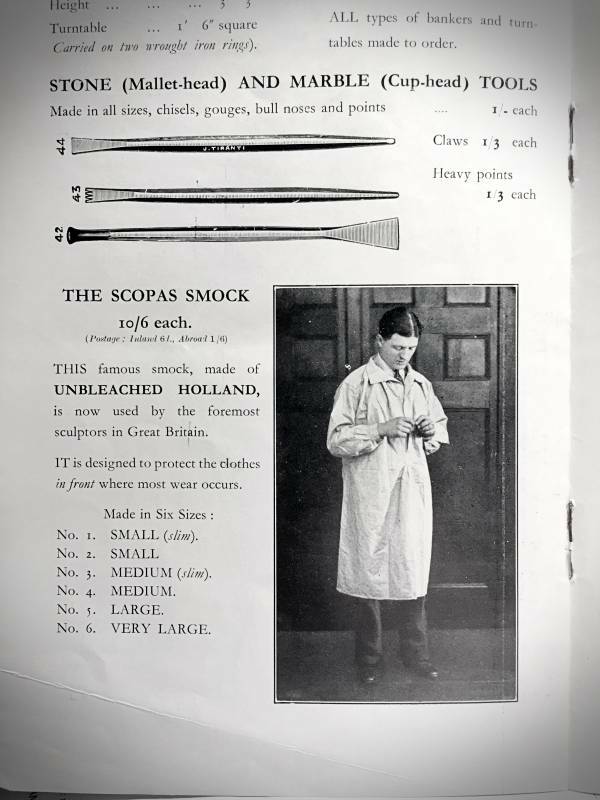 The Scopas Smock was sold in six different size slim or regular. The comfort of work clothes is subjective. Some prefer them comfortable and abundant, someone else more adherents to not hinder the movements. This smock was made in unbleached holland and used by the foremost sculptors in great britain.